Red Amaranth-Amaranthus cruentus is a common flowering plant species. 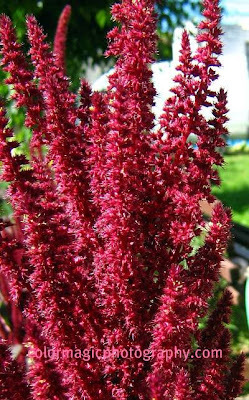 The one in the picture is the Amaranthus Velvet Curtains, much appreciated for its intense burgundy colored flowers and foliage. This annual plant can grow up to 1-2 m (6 ft) in height, and blooms in summer to fall. Its large inflorescence consists of numerous agglomerated racemes and spikes and a terminal one up to 45 cm long. The plant has many side shoot growing upright on thin branches. Besides being a focal point in any garden, Amaranthus cruentus is also used as cut flower, or can be dried. 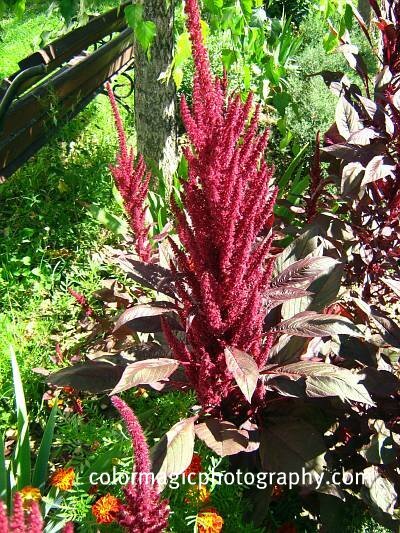 Amaranth is a very high consumer of minerals, needing rich soil, full sun and much watering. Amaranthus cruentus usually has green leaves and is an important leaf vegetable in many countries of the world, with an excellent nutritional value. I really love your macros. I love the rich ruby colors of this plant. You captured its essence. Tina, it is not my duty to change your links. Redirect your old url to the new one.